Pseudo-random number generators (PRNG) based on irrational numbers are proposed elsewhere. They generate random numbers using digits of real numbers which decimal expansions neither terminate nor become periodic and practically their decimal expansion has infinite period. Using that algorithm, we generate sequences of random numbers and then we check their randomness with statistical tests from Diehard battery. Our main idea is to check is there a difference in the randomness of the generated sequences if digits of any irrational non- transcendental number (like √2, √3,√5, … ) are used versus the case when digits of a transcendental number (like π or e) are used. In our experiments we use about 3·107 digits of a given non-periodic irrational or transcendental number. Many experiments were done and all generated sequences by proposed PRNG based on irrational numbers passed the Diehard tests very well. We may conclude that there is not a significant difference in the randomness of the generated sequences in the both cases (irrational nontranscendental versus irrational transcendental number). The present work compares two different approaches, Computational Fluid Dynamics (CFD) and dispersion model, for liquid distribution modeling with experimental data for liquid spreading in randomly packed metal Pall rings. The used experimental data are obtained in a semi-industrial column with a 0.6m diameter for several packing heights and liquid loads. It is shown that the appropriate choice of dispersion model parameters is essential for prediction of liquid distribution. In both models some parameters are determined by fitting with experimental data, the remainder are calculated or taken from literature. Comparison of the two model liquid distributions with experimental data shows that both CFD and dispersion model are in good agreement with the experiment especially for higher packing bed, when the wall flow is fully developed. In the paper a mathematical model of the non-stationary motion of a viscous liquid mixture through the vertical straight pipe of the circular cross section is proposed. During the model construction weak compressibility of the mixture is considered. The Navier-Stokes equations system is taken as a basis. Such model can be used in the description of oil motion in a vertical well. The basic principles of functioning of subsystems of the information-technological complex, which is intended for the forecast of structure and properties of the cast metal, are presented. The basis of subsystems are mathematical and simulation models of crystallization. The subsystem of thermal analysis is based on mathematical models, which were developed within the framework of the dynamic theory of metallic castings The subsystem of modeling of crystallization is based on a combination of mathematical models of heat conduction and diffusion with cellular automata. The model makes it possible to investigate in computational experiment the effect of various cooling conditions on the process of formation of the structure during crystallization. The results of computer experiment are shown. The algorithm of the heavy ball method, based on the principle of symmetry, to find a global extremum is described. The computer simulation of the method for the three test functions (Ackley, Griewank and Schwefel) is carried out. The results of the study of the efficiency of this algorithm are given. The results of mathematical modeling in the graphs, describing the process of convergence of representative points to the global optimum point of test functions, are shown. Conclusions about the efficacy of the described algorithm applied to optimization problems are drawn. In this paper we try to build a framework in active power optimization model building when controllable loads are available for balancing purposes. A certain classification of non-fixed loads is given as well as the respective variables and constraints that have to be introduced in the mixed-integer linear programming model. 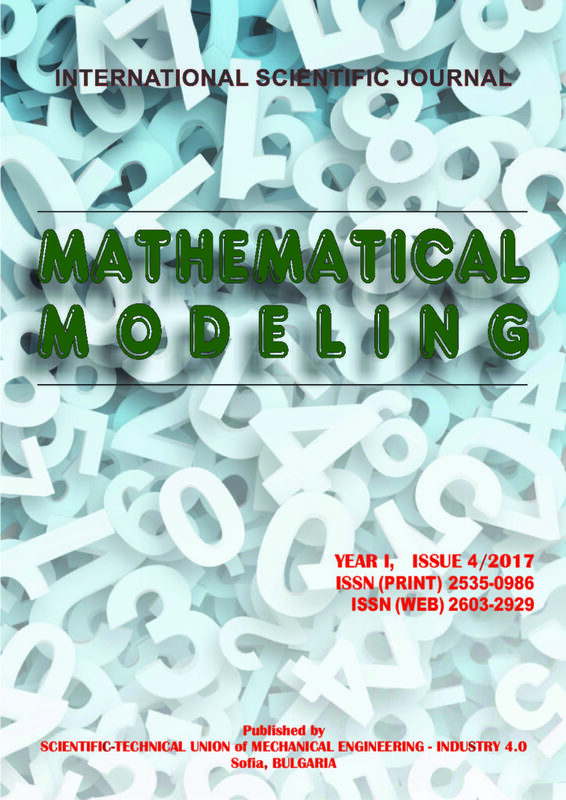 A numerical example is also given illustrating the modeling approach. Some analysis on the presented numerical data is done in order to show sensitivity to certain environmental issues. In this study, the effect of production parameters of B4C + ZrO2 composites on density was modelled by using Artificial Neural Network (ANN). The composites were produced by using powder injection molding method (PIM). In the sintering stage, pressureless sintering method under argon atmosphere was used. As the production parameters, amount of additional (A, wt.%) and sintering temperature (T, ◦C) were defined. The main aim of the study is to obtain the experimental conditions giving maximum density. As a results of this study, the production parameters of hard sintered materials like B4C + ZrO2 could be modelled by using ANN method to optimize and predict because the prediction error is blow percentage of 10%. Therefore, the research and development time and cost can be reduced by using this method.